A side-project of S. Gronbech and Thebon who are both involved in Keep Of Kalessin to various degrees, Khonsu has an air of quality about it. Throwing various extreme metal elements together into a blender rarely results in such a cohesive album, a tribute to the experience of the members - and I say that whilst never having had much time for Keep Of Kalessin even before their Eurovision attempt! Mixing huge slabs of grooving riffage with industrial and symphonic backing given a modern, blackened sheen, Anomalia is a good introductory effort from this project, although it doesn't always succeed at persuading the listener of its worthiness. That faultline runs right through the album, and can be blamed wholly on its length, seven songs in nearly an hour being pure overkill. All but one of the songs are over six minutes in length with two nine-minuters and one at over fourteen - Khonsu have a little too much to say, yet fortunately are good enough at saying it that they don't quite outstay their welcome. Opening with echoing synths that build into a galloping black/death groove, In Otherness introduces the band's ideas at a breathtaking rate, Gojira-esque groove mixed with keyboards and acoustic strums, having a dizzying yet compelling effect. Arcturus-esque piano runs fly past a throaty bellow, proggily changing with the song structure as guitar riffs chug in a menacing way, moving towards modern Enslaved territory as the music slows then quickens again. It works well, but has no need to be over nine minutes in length, despite managing to keep your attention. The following The Host is slower and grander, the vocals changing between slow declamations and chaotic snarls, sometimes drowned in electronic distortion, moving to clean vocals atop acoustic guitars towards the end. These dips into acousticland give an easy touch of class, as ever, but it's good to see that their usage is actually classy as opposed to clichéd, Darker Days Coming being a good example of their usage to further the progressive vibe along with clean and whispered vocals. 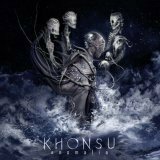 Of course, along with the arty stuff there's also an aggressive side to Khonsu, the manic Inhuman States mixing blasting and electronica to give a fine Dødheimsgard vibe, as catchy as it is lethally crunching and heavy. There's an annoying sampled voiceover (seriously, why do bands do this?) but it doesn't spoil the song. Unfortunately the following two songs are sub-par, the repetitive So Cold being very dull and The Malady verging dangerously into nu-metal territory with a mid-paced grooving intro riff and electronic backing that date it back in the early 2000s. It manages to actually avoid sheer terribleness through the melodic sections being not bad, although that riff will definitely make you wince. Fortunately fourteen-minute finale Va Shia (Into The Spectral Sphere) is a return to form, spacey ambience turning to acoustic folkiness turning to thrashy riff turning to proggy meander, modern without being mainstream, more voiceovers annoying but being forgotten in the general artsyness. It works well, but makes you look at your watch; there really is no reason for it to be fourteen minutes long, and it drags. Despite that, as a whole Anomalia remains a decent album that will please the ears of those with a taste for Norwegian modern metal. The band really need to cut their songs down and sharpen their songwriting in order to truly become a force to reckon with, however, as promising as the general vibe is, so this recommendation comes with a warning.